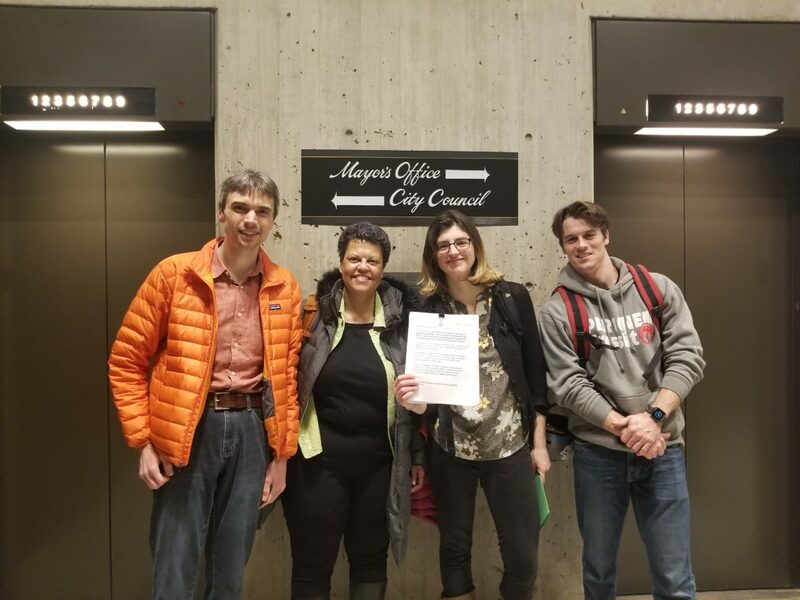 We turned in this letter to Mayor Walsh and Chris Osgood on March 21, 2019, along with a petition signed by 400 people, as part of our campaign to make Mass Ave in Dorchester safer for cyclists. We are grateful to all the businesses, organizations and groups that signed on and hope you will thank them next time you talk with them! We are writing in support of improving Massachusetts Avenue between Melnea Cass Blvd and Edward Everett Square for people biking and walking along the corridor. We applaud you for identifying this as a Vision Zero priority corridor in Go Boston 2030 and urge you to implement safe infrastructure for cyclists and pedestrians in 2019. From the City’s own High Crash Network map, we know that this section of Massachusetts Avenue is one of the 2 roads in Boston that have the highest crash rates for all modes of transportation. Massachusetts Avenue is also a critical cross-town connector for residents from Dorchester, Mattapan, and even South Boston to reach Downtown. This section of Massachusetts Avenue deserves the same Vision Zero treatment that has been implemented on other sections in the Back Bay and South End. According to the City of Boston 2017 bike count, 350 cyclists/day use the corridor, a 12% increase from 2016, which is sure to continue to increase with this year’s count. The current design creates unnecessary conflict for cars and pedestrians because cyclists individually choose how to navigate the lack of bike infrastructure and some take a driving lane while others use the sidewalk. Numerous people have told us that they stopped biking this corridor because of how unsafe the road is for cyclists. We support a design that encourages people of all ages and abilities to walk and bike and road design elements including protected bike lanes, signal retiming for safer crossings and more frequent pedestrian crossings. Because the Newmarket area has a high truck volume and given that the last two cyclist fatalities in Boston were crashes involving trucks, the final design here needs to create a physical separation between cyclists, vehicles and pedestrians. Better biking and walking infrastructure will help our businesses, our residents and our community as a whole. We hope that you will work with us and the broader community on implementing protected bike lanes and other road safety measures for pedestrians and transit riders by October 2019.